Once again, Indians stand in the way of an American gold rush. The U.S. formally recognized Western Shoshone lands in the 1863 Treaty of Ruby Valley. But in 1946, shortly after the discovery of gold in the Nevada mountains, the newly created Indian Claims Commission ruled that their vast land holdings had been lost when Congress passed the General Mining Act of 1872, awarded the Indians 15 cents an acre and foreclosed their receipt of any royalties from that time forward. The tribe refused the payment which was placed in a Treasury account where it remains to this day. 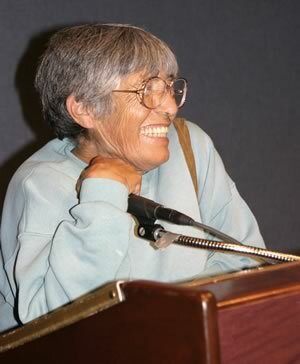 In 1991, convinced that the U.S. land claim was fraudulent, Carrie Dann and the tribe’s national council founded the Western Shoshone Defense Project. Working from a small trailer near their isolated ranch in Crescent Valley, Carrie and Mary, now nearing 70 and 80, embarked on an epic legal struggle. After exhausting every remedy in the American justice system, they took their case to the international community. Late in 2002, the OAS Inter-American Commission on Human Rights decided on their behalf – issuing the first international human rights ruling against the United States in an Indian rights case. On September 23, 2002, 40 heavily armed BLM agents descended on the Dann ranch in SUVs and helicopters and confiscated 232 head of cattle, which were later sold at auction, despite an OAS request for an injunction. In February, the U.S. was back to take 500 horses, many descended from horses given to the sisters by their grandmother, who received them from her grandmother. Five months later, the grisly remains of 47 foals and mares marked with the Dann brand were discovered on a ranch that boarded horses for the Bureau of Land Management. The reason for the harassment is simple. The Shoshone land is coveted by such powerful multinationals as Bechtel and the Newmont, Placer Dome, Kennecott and Barrick mining corporations for lucrative cyanide heap-leach gold mining, ground water extraction, nuclear waste storage, weapons testing grounds and generation of geothermal energy from the hot springs held sacred by the Shoshone.